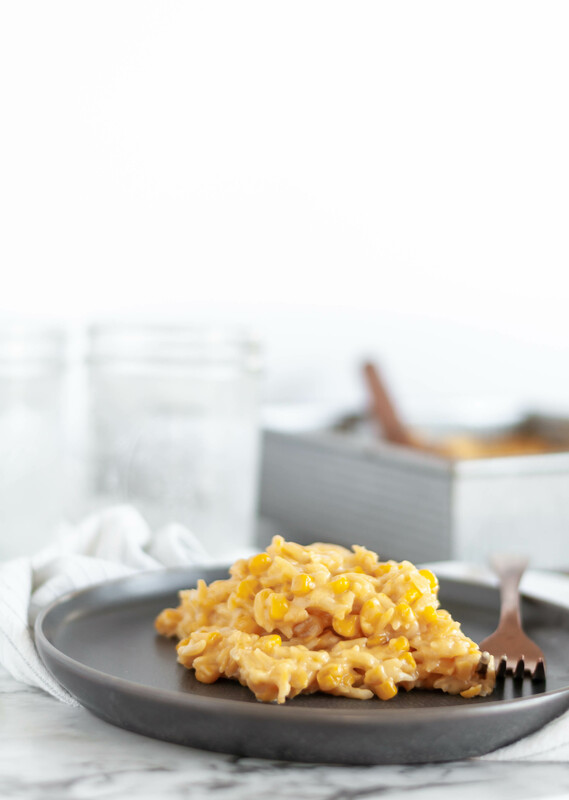 This corn casserole is a family favorite that graces every holiday table. Creamy, cheesy, simple perfection. *Update: the photos and text within this post have been updated since the original post date in 2011. You guyyyys. The photos on the original post were SO bad. Like, so hard to look at. With the holidays just around the corner I knew I needed to majorly freshen things up so you can truly understand the true deliciousness of this dish. It’s a humble little dish and there’s nothing fancy about it but that’s often what makes a favorite. We have this for EVERY holiday and I’m pretty sure there would be a riot if we ever left it out. We’re to the point that it gets requested by Joel’s extended family when we’re in Kansas City for the holidays. I’m going to start with the biggest selling point for this corn casserole. It’s 5 ingredients. You add them to the baking dish, stir and put it in the oven. Then stir it a couple times while it’s baking to bring it all together and keep it from sticking to the bottom. It literally could not get any easier. Let me also say upfront that one of the ingredients that creates the sauce for the casserole and give it the extreme creamy, cheesiness is Velveeta. I know some of you may be Velveeta haters but hear me out. If you make this a few times a year for the holidays you aren’t consuming that much. And well, the weird stuff in Velveeta is worth it because this casserole is bomb. I promise. In true casserole fashion, the ingredients may seem a little weird together but they totally work. A can of cream corn, regular corn, a stick of butter, orzo pasta (or any really small cut pasta) and Velveeta are all you need. The corn adds sweetness and texture to the casserole and obviously is a major component to the dish. The sauce in the cream corn adds even more corn flavor and creaminess. The orzo pasta adds more texture and bulks it up. If you can’t find orzo or don’t want to buy it just for this recipe, you can use those little stars or rings or you could even break up spaghetti noodles into tiny pieces. Just make sure it’s a similar size to the corn to keep things consistent and make sure it cooks through. We have corn casserole with every holiday meal but I especially love it paired with ham. If you’re looking to make this outside the holidays it’s really yummy with barbecue chicken too. I hope you try this simple casserole this year. I’m pretty sure it will become a family favorite in your home too. Corn Casserole is a family favorite that graces every holiday table. A super simple ingredient list and even easier preparation. Preheat oven to 325 degrees F. Add all ingredients to an 8x8 baking pan. Stir together. Bake for 40 minutes, stirring 2 to 3 times. I learned this recipe from my step-in-laws when I got married to Mike. It is yummy!!! We go through 2 batches for holidays (Mike has 4 younger brothers ;)). I live on casseroles. I’m suprised you are not more fond of them since you like to bake. I really don’t like to cook, so I’d prefer to bake lunch and supper too! Plus casseroles always = leftovers which I love to have on hand. I really need to start learning to love casseroles living in such a cold place! I don’t know what it is about them….just don’t really enjoy them. So yummy looking! My girls love ANYTHING corn, so they are definitely going to devour this one! my mom was just telling my yesterday that she was looking for a corn casserole recipe! I’ll send this her way! I’m gonna try this with Campbell’s new Creamy Sweet Corn soup instead of the creamed corn! Oooh, that sounds good! Let me know how it turns out! Is the can of corn drained (like you would normally do) or undrained to provide liquid for the pasta? Hi Paige! Undrained for the corn. It adds more flavor to the casserole and helps make it even creamier. I’ll update the recipe to reflect that, sorry for the confusion. I hope you try it and love it!